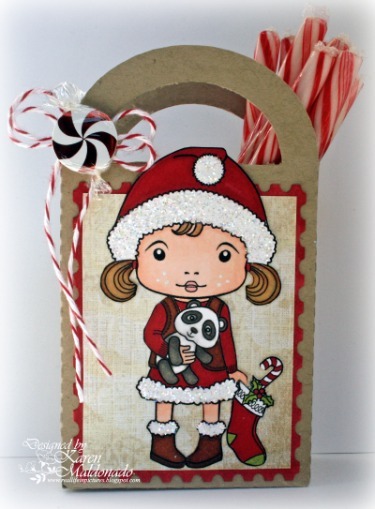 La-La Land Crafts Inspiration and Tutorial Blog: Sweet Treats with Santa Marci!! Hello there..it's Karen, and I am here sharing Santa Marci with you today!! I decorated this 3x5 kraft treat bag with peppermint stick candies! You could actually fill the treat bag with anything, but I decided to choose peppermint sticks! During winter time, our family loves to dip peppermint sticks into hot chocolate! Yum!! I also added some crystal glittter to Santa Marci's hat, dress and top of her shoes for a little sparkle!! If you have some projects that you would love to share with us, please upload to our Customer Gallery! We'd love to see your creations!! Each month, we randomly chose a lucky winner! So, upload as many times as you would like!! Have fun creating, and thanks for stopping by today!! If you get a chance, scroll down and see what our newest Guest Designer, Debbie, has created today with Birthday Marci! It's so precious!! ADORABLE and oh SO SWEET!!! What a GREAT idea!! Love it! I love all the glitter! Cute project! Adorable Karen...she's just so SWEET!! Really great job! WOW I love this!!! way to rock the sweet treats!